1. Are you telling visitors who you are and what you do right away? To capture attention immediately, you’ll need to differentiate yourself from the competition in a way that’s clear and concise. So who are you? A respected leader in maritime law? 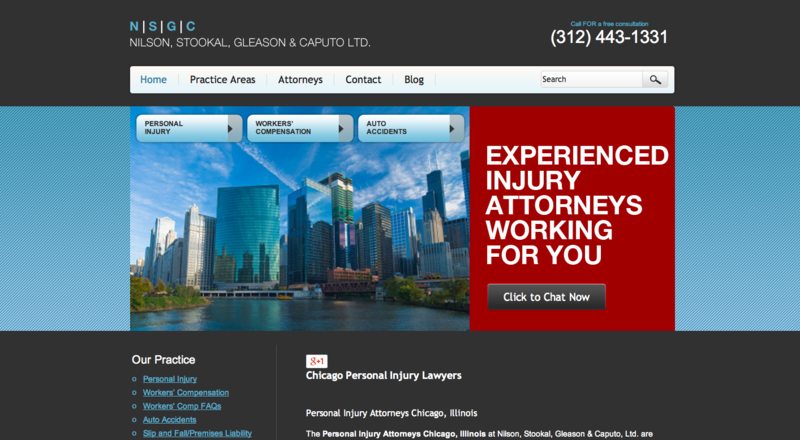 Chicago’s well-known source for workers’ compensation? The family man to trust for divorce and custody cases? And what do you do? Keep children out of the foster system and place them with kin? Help people minimize inheritance tax? Make overstepping police wish they had read the Constitution? Many attorneys offer several types of representation, so place the visual focus on the one, two or three most profitable areas of your practice right now. They may be what you’re becoming known for, and a concentration in one practice area frequently trumps generalization in clients’ minds. This is especially true when your competition — other attorney marketing sites — are highlighting their own subject-matter knowledge and experience. Notice how this site highlights their strengths with the largest letters and boldest color scheme. There is exactly zero question about who this firm is and what they do. 2. Our eyes can look at exactly one thing at a time – choose wisely. What is the one thing you want prospective clients to know at the expense of all else? They can look at only one thing at a time, and some element of your page will be the first. You get to decide what that is through design. 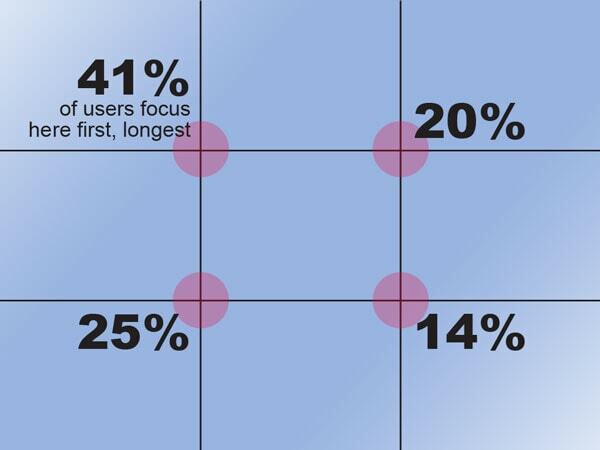 Utilize the rule of thirds grid when placing your visuals for maximum impact. Many trends come and go in website design — sliders, pop-up bubbles, continuous-scroll pages, etc. — but our eyes remain attracted to the four points where the lines cross in a nine block grid. Place vital information on these points to control the focus of your visitors and give prime real estate to the messages you want to communicate first. 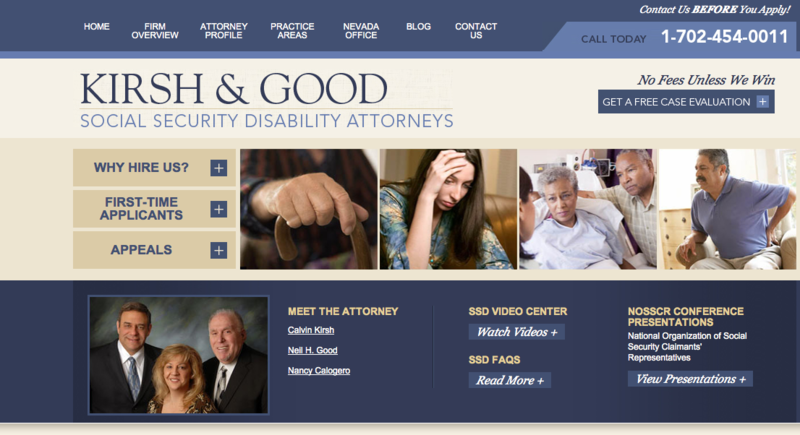 This attorney marketing site utilizes the most powerful point of the grid, the top left, to draw attention to their strengths. 3. Is it possible to simplify your layout? Hunting for legal representation usually takes place during stressful times. No one will be impressed with your flash-based site and its edgy layout if they can’t find exactly what they’re looking for — your help. It’s possible to construct your site to be navigable for a nine-year-old but appreciated by a 49-year-old. Make it as easy as humanly possible for someone to find the answers they need from your site. Opt for fewer tabs, not more. Choose two or three colors, not five. Select one or two fonts, not four. A good rule of thumb is the famous adage that a project is complete not when nothing else can be added, but when nothing else can be taken away. One statement, three tabs, three colors. Simple. How does your homepage stack up? You don’t have to rate yourself alone. Usability Hub lets you submit your homepage to its testers for free. You’ll receive their detailed feedback and charts of the most common responses. Do you suspect you make a better pitch in the elevator than online? Market JD is here to help with that — online attorney marketing is what we do. Contact us for a free consultation and learn how Market JD converts visitors into quality leads through expertly crafted web design.